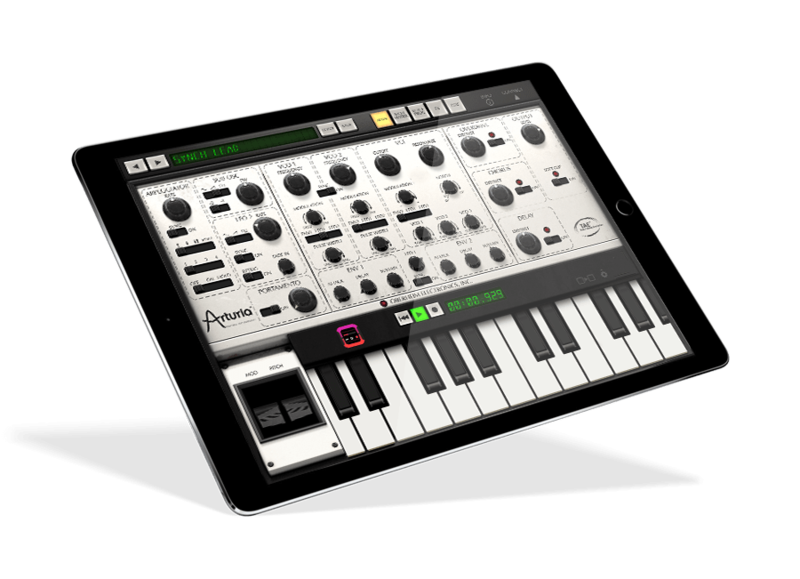 iSEM is our physical model of the legendary 1974 Oberheim SEM synthesizer expander module, now available for iPad®. TAE® is "True Analog Emulation" - Arturia's exclusive technology that accurately reproduces the tone, waveshape, tuning and other detailed characteristics of an analog synthesizer. TAE® recreates the characteristics of analog oscillators in amazing detail. The transparency and clarity of our analog synthesizer emulations give musicians the freedom to be inspired by classic sounds or explore new textures knowing that the previous limitations of digital oscillators will not interrupt the creative flow. Filters are a major element in subtractive sound synthesis. It is important to reproduce the exact characteristics of analog filters in the digital domain, as well as the individual characteristics of classic instruments that give each one its unique sound. Soft clipping can give the sound more punch and presence, not to mention limiting the amplitude of the sound. It’s another important aspect of the circuitry that gives analog synthesis its character. 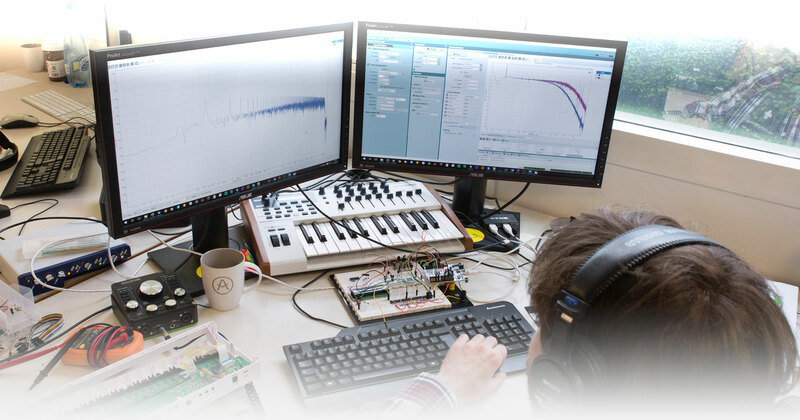 TAE® instruments are created using the most advanced DSP techniques by today's standards. Depending on the context, our instruments are modeled starting from mathematical models, physical models, simulations of their circuitry. From then, we sit next to the instrument we are modeling and listen to every little nuance in the sound it produces. 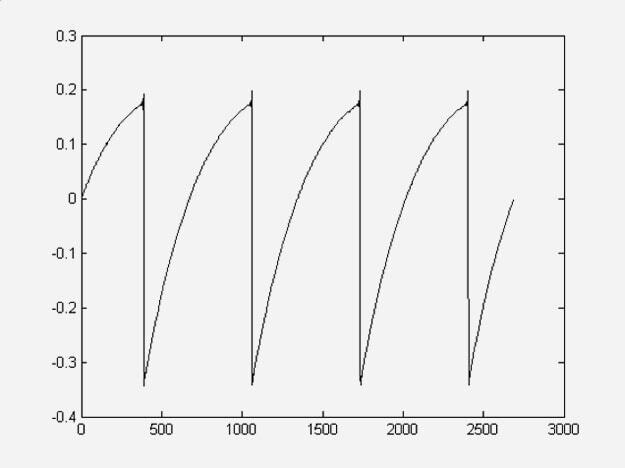 It could be the response of the filter cutoff knob, a small artifact in the waveform of an oscillator, even the noise that is generated by the circuit. Then we find ways to reproduce those behaviors in the digital domain. It takes a lot of effort and a good knowledge of the analog instrument we emulate, because those subtle variations to the "perfect" sound are never the same from one synthesizer to the next, but it is what makes our emulations so true to the original. TAE® oscillators are very similar to their analog counterparts for several important reasons. One of the main reasons is that they are "free-running"; i.e., they are not sampled, wavetable-based or generated from a 0-point when a note is played. Each waveform is generated dynamically, which is more consistent with the way the original devices worked and with the laws of physics. Thus our oscillators avoid one of the major tell-tale signs of digital waveform generation and provide that level of "liveness" found in the classic analog synthesizers of the past. Standard digital synthesizers produce aliasing in high frequencies, and also when using Pulse Width Modulation or Frequency Modulation. TAE® allows the production of oscillators that are completely free of aliasing in all contexts (PWM, FM, hard sync, etc. ), at no extra CPU cost. TAE® oscillators are highly optimized for each digital environment, so you’ll be able to play our instruments exactly as you would if you were playing the original analog synthesizer. Again, the waveforms are not pre-sampled and regenerated with digital perfection; each note has a life of its own. Another factor is that the original analog oscillators were basically unstable. And we’re not necessarily referring to the pitch; actually, their waveforms were always slightly different from one period to the next. And due to analog hardware sensitivity, new period trigger times varied with the temperature and other environmental conditions. 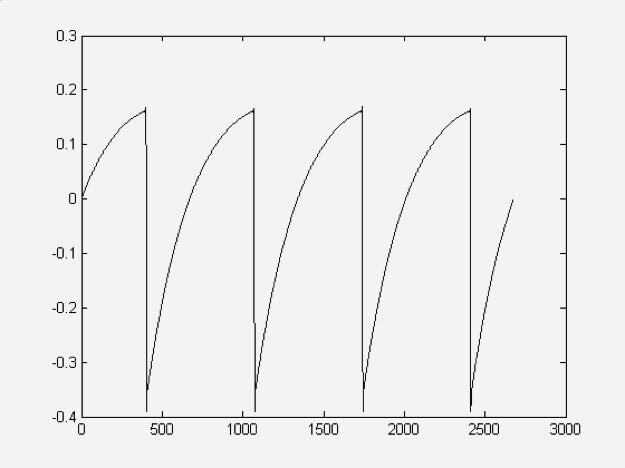 So we factored that in, too: TAE® simulates the oscillators’ instability, which helps to create a warmer and fatter sound. Original analog oscillators used the condensers' unloading to produce common wave shapes (sawtooth, triangle and square). This means that waveforms were slightly curved or distorted in other ways that are considered highly desirable in a musical context. TAE® allows the reproduction of a condenser's unload in order to give you the original analog sound. And since TAE® oscillators behave in all of these “lifelike” ways, when you play a simple chord with the raw oscillators you won't get the impression of digital "fog" or a static sound. Instead you’ll hear a refreshing transparency and clarity. With TAE® you can even produce complex PWM sounds with unprecedented quality and free of any aliasing. This is true for all of our TAE® waveforms (square, triangle, saw, etc.). Our instruments produce sounds which are unique on the market, because PWM is very difficult to achieve on certain waveforms like triangle or ramp waves. TAE® brings new levels of reality in a virtual analog synthesizer, so that you can achieve new levels of creativity in your music. 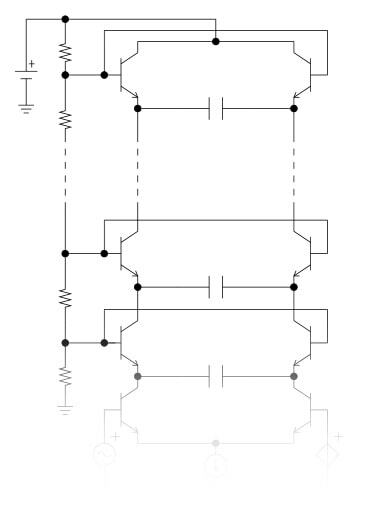 TAE® reproduces the characteristics of analog filters in the digital domain. Let’s take our Prophet-V for example. Due to advances in computer processing power, Prophet-V can employ direct filter modeling techniques to achieve unprecedented accuracy in the emulation of the original 4-pole low-pass analog filter. By modeling the operation of the individual hardware components of the filter circuit, the warm nuances synonymous with the original analog instrument are recreated. This graph is a frequency domain plot that serves as just one example of direct circuit modeling in action; it shows the generation of harmonics at multiples of the resonant frequency when the filter is in self-oscillation mode, for both the virtual (blue) and original (red) instruments. These harmonics are characteristic of the Prophet 5's filter and are due to the non-linear behavior inherent in its analog circuitry. The generated harmonics add to the richness and warmth of the sound produced by the filter. As a result of the direct modeling of the analog circuitry the same sonic characteristics are present in Prophet-V, thus giving the user a truly analog sound. In analog synthesizers the resonant filter uses a current-limiting function, which prevents the signal from being too loud (soft clipping). TAE® emulates this current-limiting function, making the sound more natural. It also allows filters to enter self-oscillation like original hardware synthesizers do. Also, soft clipping can be a kind of saturation effect, but with a very particular shape. Common shapes can't give good results compared to analog soft clipping; it is a peculiarity of the output amplification stages of analog synthesizers, and is a critical component to the analog sound.